On Friday, a reader told me that Google was testing a new form of phone numbers in AdWords ads. He sent me a screen shot and I used it over at Search Engine Land. 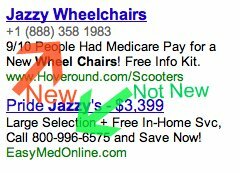 Today, based on DigitalPoint Forum thread, I decided to try it reproducing it and I was able to for the search [jazzy wheelchairs]. Currently testing a feature with a small number of advertisers in which a phone number can be included within the ad to help them more effectively engage with customers who prefer to connect over the phone. Do you like this feature? Forum discussion at DigitalPoint Forum. Previous story: Google Buys BumpTop, A 3D User Interface For Chrome OS & Android?